The first volume of Between Places. Not up to reading 300 pages? Get the fast track here! A stand-alone story about the end of a dream. Current progress: Script: 100%, roughs: 100%, page 1 of 8. I'm... back? Sort of? Those Who Favor Fire is a short comic I did for 24 hour comic day. Some of you may have already read it... in fact, I can practically guarantee that almost all of my readers have already read it! It's 24 pages long, and I plan to maintain my old update schedule (which shouldn't be too hard, as all of the pages are already drawn... I'm just touching them up and changing some of the writing), which means it'll come to a close in mid-December, just before Christmas season goes crazy. Between then and now I will be doing NaNoWriMo, so as well as posting the 'old' pages I will probably post excerpts in the news, so please, tune in if you're interested in my writing mad-cap madness. Afterwards I will likely move this to a new archive, as it isn't actually "Between Places", it's a separate, stand-alone story intended to be read as a stand-alone story. It may, however, turn into the prologue or chapter one for a different story, in which case, well, I have a couple of months to get some buffer going. ;) I miss updating, frankly, so I hope a couple of people tune in for this one! I realize it's not continuing the story you guys want to read... and in this case, I'm afraid it may never continue (quite frankly we'll see), but it is about at LEAST one of the characters (coughcoughmorethanonecoughbuteveryoneevenmyco-writerwastoodensetonoticecough) and will update regularly, yay! New vote incentive on the side to update things. If you're the generous sort, I'm raising money for NaNoWriMo here, so I can go to the Night of Writing Dangerously (maybe). Changes: I didn't feel it was necessary to repeat that she spent the day sleeping. 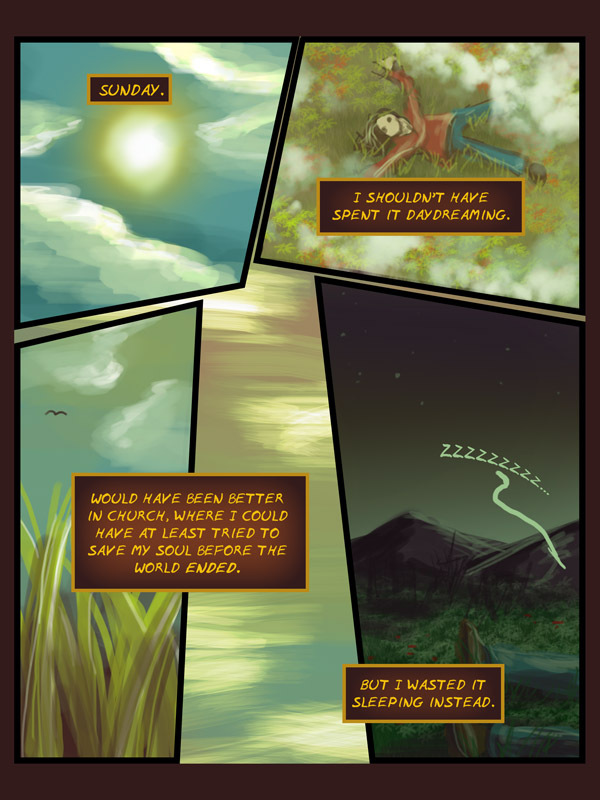 Fixed up the clouds in all panels. Changed Abroidine's costume to reflect her actual costume more accurately (I wanted fast for the 24 hour rush). Changed the orientation of the text so that more art showed (I was using it as a cover to avoid detail, but in retrospect I thought the underlay panel was very boring and a better text holder than my actual text boxes). Tuesday's page is done and uploaded. Copyright 2008-2011 Tiffany Munro; contact me. Between Places is a genre-bending fantasy graphic novel. Rated PG-13 for occasional graphic violence, mild language, evil people, and complexities that your average teenager probably won't understand. Updates Sunday, Tuesday, and Thursday. Warning: contains elves, vampires, magic, sparklies, dragons, wizards, and cell phones, and worst of all: no fanservice!